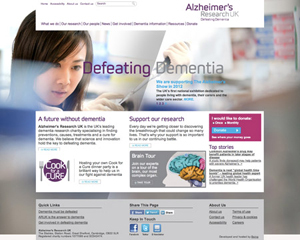 Job description: The Alzheimer’s Research Trust was rebranding as Alzheimer’s Research UK, which included the launch of a new website. I copy-edited and proofread the web copy in accordance with the new brand guidelines. The main challenge was ensuring that the large amount of multi-authored content had a consistent style and voice across the site, and clearly conveyed the charity’s new brand identity. Thanks for your outstanding work Munizha. The editing is great – putting things into a more active voice and making our key messages stand out. Your attention to detail is much appreciated.